The real cost of spam encompasses many aspects which have a direct financial impact to business operations. The primary cost of SPAM to the business is lost productivity which is attributable to time spent reviewing spam. The total cost of spam to companies is estimated by research groups is estimated to be as much as $500 per employee/per year. An effective SPAM control solution and education will help companies handle spam more efficiently and save most companies a significant amount of money. It takes approximately 65% more time to track down legitimate e-mails which are missing or deleted than reviewing possible spam e-mails in a quarantine folder. Lost e-mails can also be very costly in terms of missed meetings or lost opportunities. In recent studies, the proportion of spam in email flows was nearly 70%. Nearly 75% of SPAM emails were no more than 1 KB in size. Only about 20% of all e-mails originate from known legitimate servers. Spam is predicted to cost over $130 billion to business worldwide. Many computer viruses are now designed to hijack computers to send out spam – turning them into so-called spambots. It is estimated that up to 25% of computers (150 million plus) could be bots. Please note the TEKEASE calculation is only an estimate. 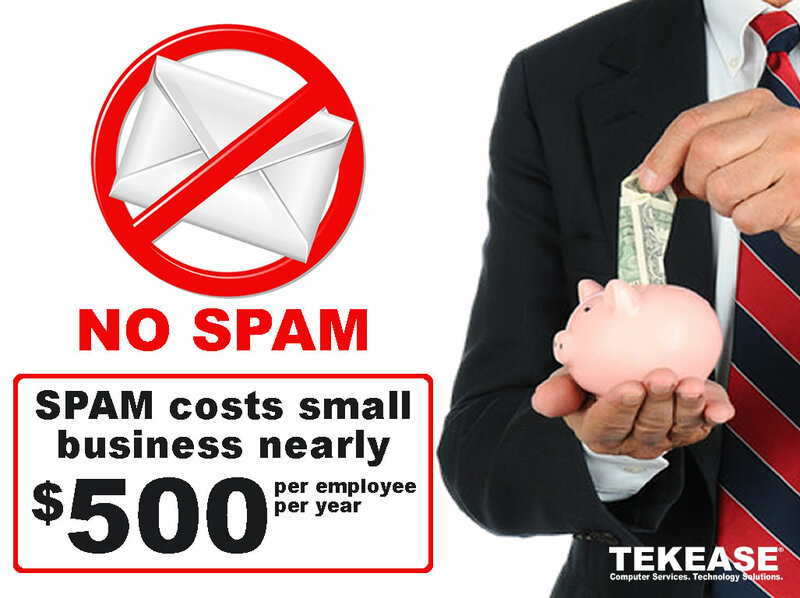 Tired of dealing with SPAM, join the thousands of users who are protected by TEKEASE SPAM Control. Please contact us to meet with a TEKEASE Technology Consultant for a more complete evaluation.